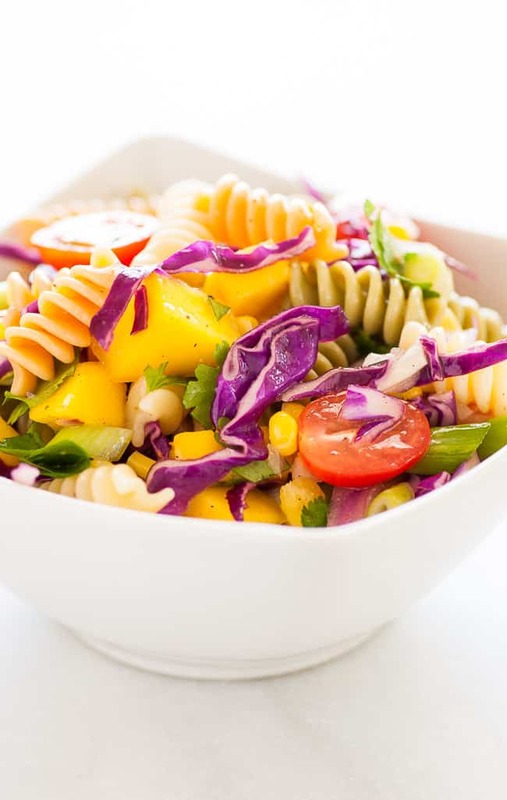 This cold mango pasta salad would be a perfect accompaniment to any meal in the coming summer months. It’s refreshing and citrusy with a nice mango sweetness to it. Here in Florida, they are practically giving mangos away this month, (not really…4 for $5.00). That’s a good deal though. Mango is a perfect addition to a cold, summery salad. Or, pick up some mango and make a delicious mango salsa like my rhubarb mango salsa. I’ve read that 70% of the mangos grown in the U.S. or imported are available from April to July so they should be readily available right now. 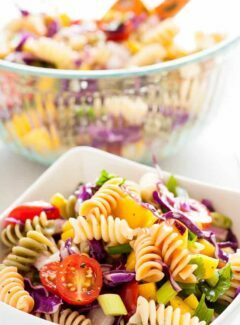 I made the mango pasta salad using mostly vegetables I already had in the house. Like red cabbage that has been around awhile. Grape tomatoes that I bought when they were buy one get one free. Part of a red onion from a couple days before. Frozen corn from the ice box. The dressing is a simple citrusy vinaigrette with olive oil, white wine vinegar and lemon juice. I mixed this up in the early afternoon and refrigerated it for a couple hours and found that the flavors melded together beautifully with the time in the fridge. We ate this with fresh speckled sea trout that a neighbor of ours caught that very morning. I did a simple batter of Shore Lunch breading mix on the fish and it was delicious with the mango pasta salad. Pick up a mango or two and savor the sweetness of this delicious fruit. 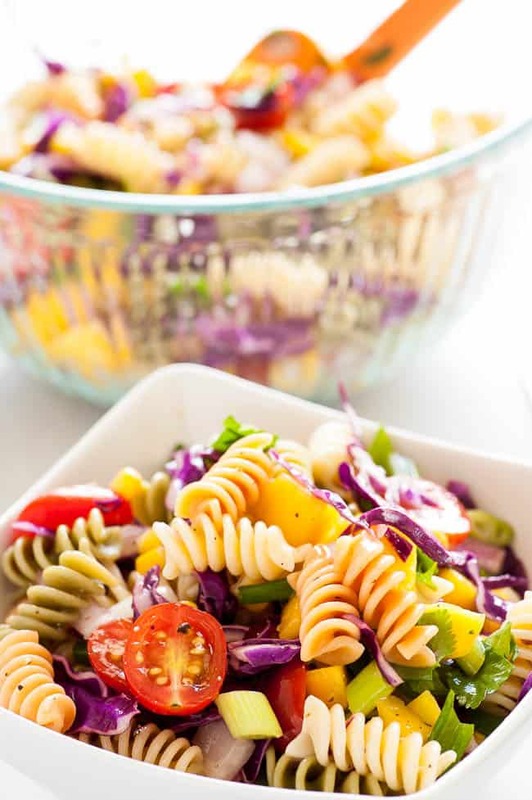 And think of making this simple mango pasta salad for a summertime meal. 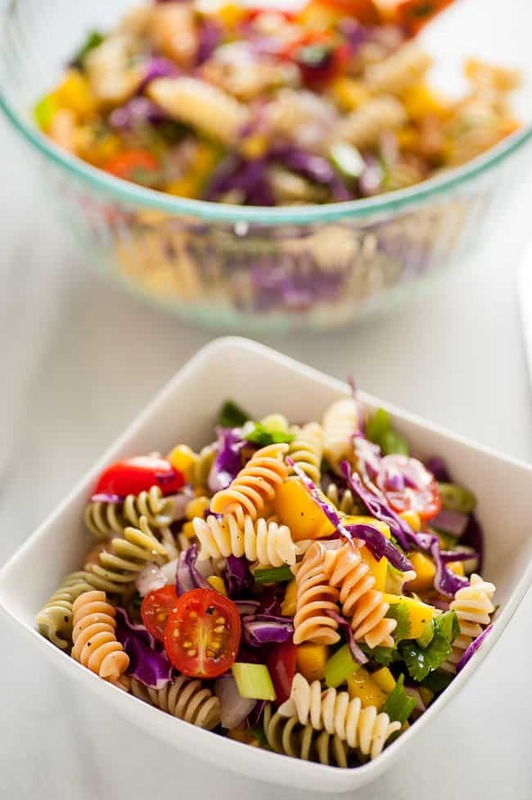 This cold mango pasta salad would be a perfect accompaniment to any meal in the coming summer months. It's refreshing and citrusy with a nice mango sweetness to it. 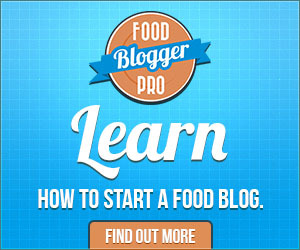 Shake or whisk ingredients together to emulsify and re-shake or whisk before adding to the salad. Fold all ingredients together in a bowl, add the dressing and mix to fully coat. Refrigerate for 1 or 2 hours to meld flavors for best taste. I especially loved the red cabbage in this salad, but everything worked together really well. This would be a hit at a potluck!